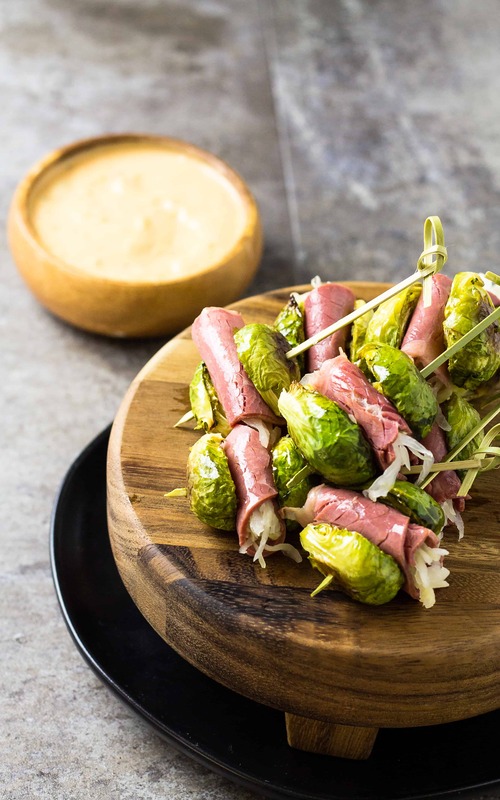 My Reuben Skewers are a new take on the traditional Corned Beef and Cabbage. Roasted Sprouts make great buns, sandwiching delicious corned beef and sauerkraut. Eat them plain or dip them in a homemade 1000 island dressing! It’s that time of year when everyone starts cramming corned beef and cabbage in their mouths with reckless abandon. Big pots of boiled cabbage accompanied with perfectly brined beef accompanied by an ice cold beer. If you like your corned beef and cabbage in a more portable package, you probably prefer a Reuben sandwich! 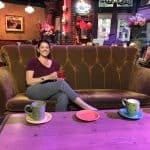 My husband loves a Reuben Sandwich with all the corned beef piled high with Russian dressing, sauerkraut, and Swiss cheese between two slices of grilled Rye bread. What’s not to like about that? Even though the Reuben sandwich is portable, it tends to be a little messy and hard to handle. In trying to make the Reuben a little less messy, and gluten-free for those watching their carbs, my Reuben Skewers were born. My skewers may not have all the ingredients in a traditional Reuben sandwich, like the Rye bread and Swiss cheese, but they are just as tasty! I simplified the process by buying my corned beef already corny and cooked. While shopping I grabbed a package of that tart and briny sauerkraut and enough Brussels sprouts to make all the skewers or “sliders” as I am calling them for this post. 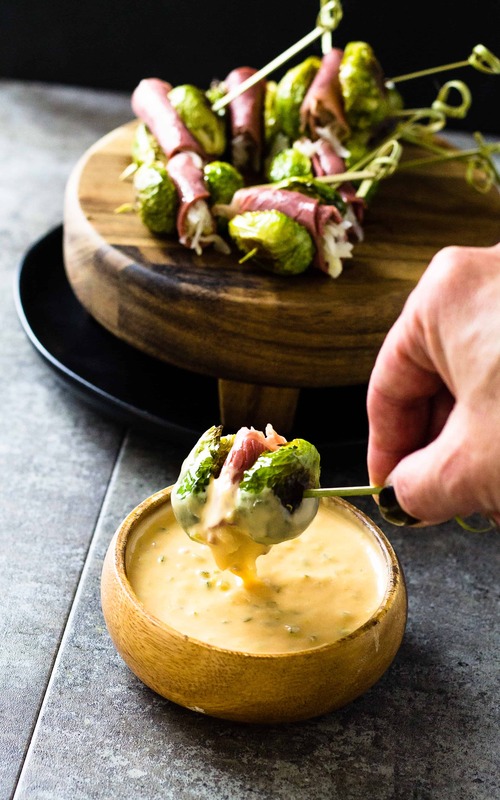 Because the corned beef and the sauerkraut is already prepared all you need to do is prep and roast the Brussels sprouts and mix up your dipping sauce. Trim the end of the sprouts, peel away any “bad” leaves, and half them through the core so the leaves stay together. Toss with a little olive oil and sprinkle with salt and pepper to your liking. A quick roast in the oven and they are tender and delicious. When ready to serve the Reuben skewers, place a little of the sauerkraut in a piece of corned beef and roll it up nice and tight. 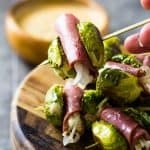 Place it between two halves of your roasted Brussels sprouts to “sandwich” the corned beef and sauerkraut making mini sliders but without the buns! Serve with a Russian dressing or a homemade 1000 Island Dressing. Don’t be afraid to plate these cute skewers in a smear of the dressing or just place it all in a bowl for dipping! 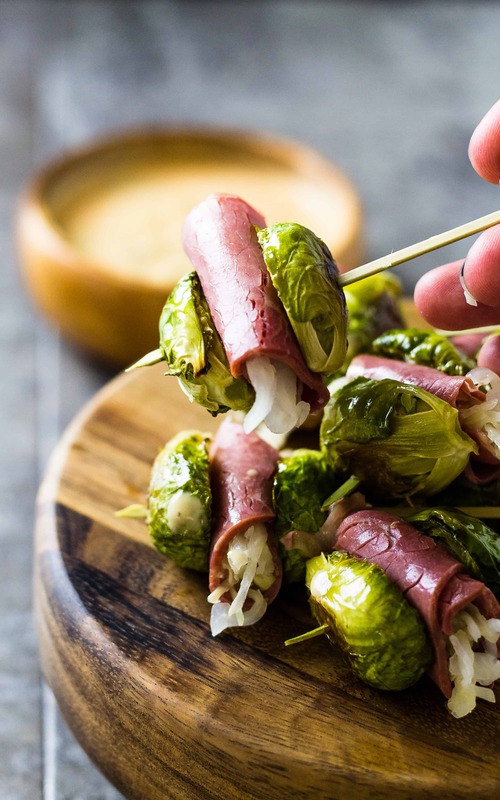 These Reuben Skewers will be the hit of your St. Patricks Day party or any other occasion when you need cool food on skewers or you are in the mood to be corny! 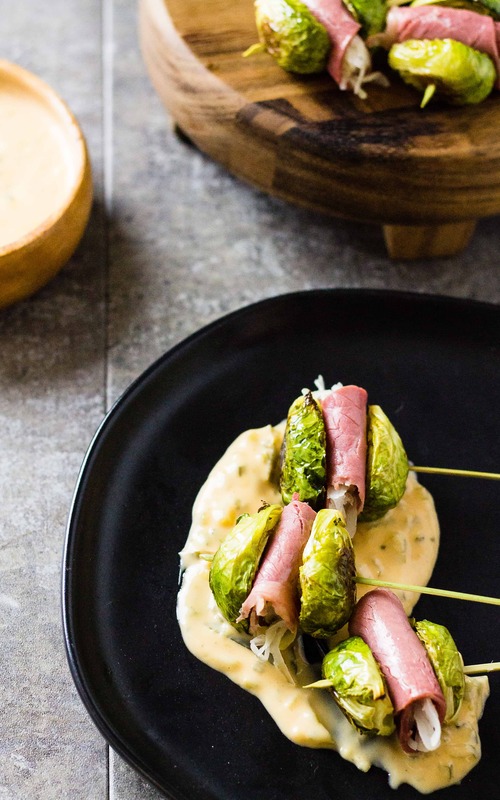 My Reuben Skewers are a new take on the traditional Corned Beef and Cabbage. Roasted Sprouts make great buns, sandwiching delicious corned beef and sauerkraut. Brush the Brussels sprouts with olive oil. Roast on a baking sheet for 10 minutes or until sprouts tender and starting to crisp. Remove when done to your liking. Cut the corned beef slices in half. Place a tablespoon of sauerkraut on the end of a slice of corned beef. Skewer one half of a sprout, add on the corned beef roll up, and cap with the other sprout half. Continue with remaining sprouts, corned beef, and sauerkraut. Combine the mayonnaise, ketchup, relish, onion, vinegar, and hot sauce. Serve the skewers with the dressing and enjoy! *If you like this recipe, leave a comment and rate it with some stars!! « Easy No Bake Cheesecake Bites for Spring! I made this for my husband becasue we had a ton of corned beef leftover and his absolute favorite veggie is Brussels sprouts. Can I tell you he ate the entire recipe? EVERY, SINGLE one of them! Needless to day I will be making them again for him as I love that they fit his low carb diet! I’m so glad he liked them!! I usually only eat corned beef by itself but I like the little rollups! This sounds like a wonderful recipe. Got to try it!